The Dublin County Choir originally grew out of a church choir in the Dundrum area, and held its first rehearsal in in Gort Mhuire, Dundrum in October 1976, its first ever number, the longest-standing members recall, being J. L. Molloy’s Kerry Dances. Over the next three years its first director, the late Eamonn Kealy, directed the choir with great success, attracting new members, winning prizes at the major choral festivals and presenting the choir’s first concert on 26th May 1977 in the RDS Concert Hall. Among the choir’s successes in 1979 was winning the Finglas Music Festival. One of the other choirs competing in that festival was directed by the ex-NSO horn player, Colin Block, already beginning to make his mark as a choral director. Later that year, when ill health forced Eamonn to retire, Colin Block was invited to become the DCC’s musical director, and thus began an artistic partnership which has lasted to the present. Under Colin’s leadership the choir earned continued success at choral competitions but also moved decisively onto the concert platform. Critical acclaim for Carmina Burana in Trinity College on 14th March 1981 marked a significant step in the choir’s progress. 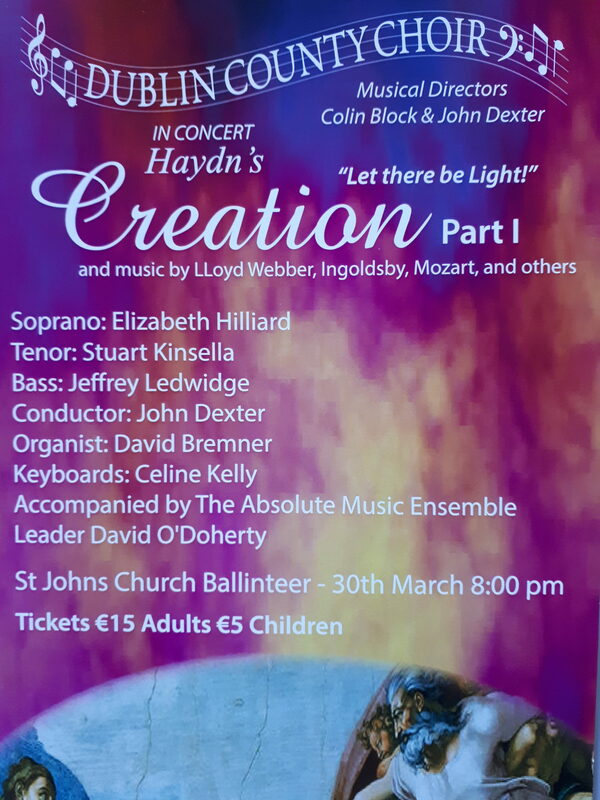 In the intervening years it has performed this work no fewer than seven times, and expanded its repertoire to being one of the most eclectic and adventurous of any of the big Dublin choirs. This repertoire has always ranged beyond the standard choral works – most of which it has performed at one time or another – to cover the musical spectrum from oratorio and opera to pop and Broadway musicals, Gilbert & Sullivan, and the carols which are the mainstay of its annual Christmas concerts. Highlights of recent years have been a nostalgic tribute to ABBA and the Beatles; an ambitious presentation in 2004, jointly with Culwick Choral Society, of Walton’s Belshazzar’s Feast; and two Irish premieres of 21st-century choral works: in 2003, Karl Jenkins’s The Armed Man, which has since become a standard repertoire item for Irish choirs, and in 2008 Paul McCartney’s Ecce Cor Meum. In April 2009 the National Concert Hall was sold out for another tribute, this time to Freddie Mercury and Queen, with arrangements specially prepared by Colin and by Liz O’Connor and Brian Ingoldsby, members of the choir.